Two days, 849 posts, 58,864 comments, 315 categories, two super dedicated website developers, and one slightly crazed website develop-ee later (ahem, that would be me)…and I think I can safely say WE MADE IT! It was quite an epic journey to be sure, but Melissa and Erin were fearless captains (and I was curled up in a corner in fetal position just waiting for it to be over…but that’s neither here nor there). And really when we started, I’m not sure that I could have even imagined that it would be this pretty and FUNCTIONAL. And yet here we are. So come, let me show you around. First of all, I love how clean it feels! My old site was getting pretty cluttered but it had been that way for so long that attempting to clean it up just seemed so…daunting. But then, as with all moves, you find yourself doing quite a bit of introspection. Asking, “Do I really need that badge on my sidebar?” and out it goes. Just like that. Spring cleaning in July. Better late than never! Next. The Recipe Index. Which, honestly, is my favorite part of the whole thing. Now, it is still a work in progress because I haven’t finished updating all the featured image photos so that it knows which picture to display for each recipe, but the fact that there are even pictures at all and not just an endless string of recipe titles is kind of blowing my mind. And, it updates itself. I was always months behind on updating my old recipe index, so this fact is kind of a gold mine in and of itself. 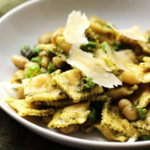 On the right sidebar, there will be a constantly changing rotation of seasonal recipes so that you will hopefully get some inspiration whenever you stop by and under each recipe, there will be a mini (auto-generated) round-up of related recipes so that if you’re in the mood for pasta but maybe not this pasta, you still might find something you’re looking for. I’ll also be partnering with Ziplist to share my recipes and also to make it easier for all of you to save them all in one place. What is Ziplist you ask? Basically it’s a service that you can use for recipe saving and meal planning. The whole thing is free, so all you’d need to do is sign up and click that little “save recipe” icon under my post heading. Then, when you’re deciding what to make for the week, all you’ll have to do is add the recipe to your meal plan and it will generate a shopping list for you that you can then arrange by aisle of the grocery store, or however you’d like. In addition, they also have various grocery deals that you can take advantage of…so it just might be worth checking out if you haven’t already! But have no fear! You can always share/save my recipes in the usual social media outlets and now it’s even easier to do so because of all the cute sharing buttons at the bottom of each post. Winning. Okay, I think that’s it. Phew. That little walking tour of ours just stirred up my appetite. And there’s nothing better to break in your new home with than a big bowl of pasta. Am I right, or am I right? Especially when we’re talking about spaghetti that is smothered in a richly flavorful roasted red pepper sauce and subsequently dotted with bites of kale and feta. Swoon. 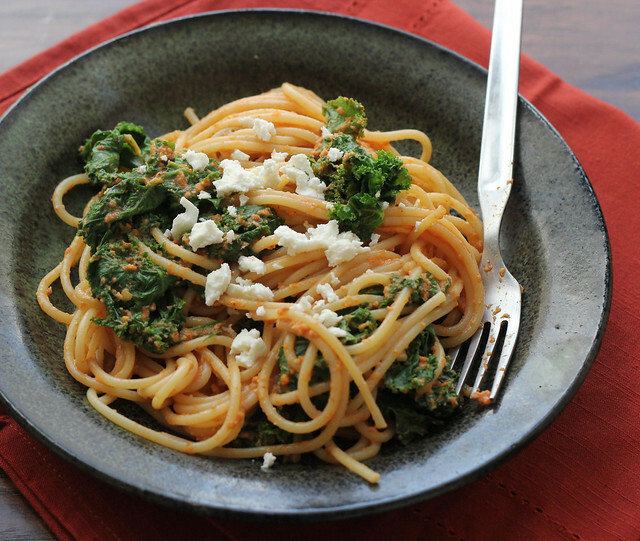 Spaghetti is tossed with a richly flavorful roasted red pepper sauce, along with kale and feta, to make for a Mediterranean-infused comfort-filled dinner. Heat oven to 450. Place the peppers on a parchment-lined baking sheet. Roast for an hour, turning every fifteen minutes, or until all of the sides of the peppers are charred and bubbling. Transfer roasted peppers to a bowl, cover, and let rest for about 10 minutes. Meanwhile, bring a large pot of water to a boil. Cook the pasta according to package directions. Place a strainer in the sink and add the kale to it. 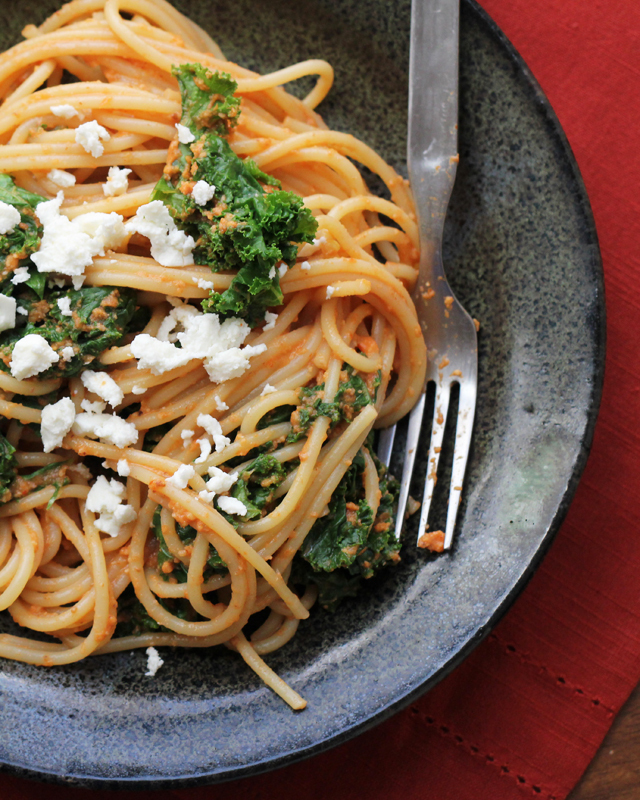 When the pasta is done cooking, reserve ½ cup of the pasta water, and then pour the pasta and remaining cooking water into the strainer so that the hot water cooks the kale. Return kale and pasta to the pot. Peel the skins off the peppers and throw out. Deseed the peppers and coarsely chop them. Place in a food processor along with the olive oil, pecans, salt, red pepper flakes, and garlic. Process until smooth. Season to taste with salt and pepper. Add the sauce to the kale and pasta and toss to coat, stirring in pasta water as needed until sauce is the right consistency. Mix in the feta cheese and serve. I love your new blog look! And I’m seriously dying to try this pasta. It looks delicious and easy, both of which are pretty important to me right now. I am so in love with your new design Joanne! It’s beyond gorgeous, and I’m totally swooning over the recipe index. Thanks for giving me a little push to get going on this myself 🙂 Oh, and the pasta looks delicious too. Heck, yes!! You DID make it, and the site looks absolutely LOVELY!!! Omg. Totally digging the logo! Isn’t it nice when you un-clutter something in your life, and you can just let out a sigh. Wow, love the new look! Ziplist seems like a wonderful tool, and your Recipe Index is beautiful. Well done, team! Lovely. I especially like the tagline “Mostly ridiculous…” It looks like your recipe index needs a little work. I’m pretty sure breakfast is filed under soup and I definitely saw a chocolate cake filed under salad. Good luck with the fine tuning… while I go off and bake a cake and tell my husband it’s salad. He’ll believe me! Haha yes, I did notice that but if you actually click the “more” button for each category, it sorts itself out. I think with time it will all get into the right category! Joanne – love love your new website design! It’s so clean and just pretty to look at! Great job! That recipe index is wonderful with the pics! 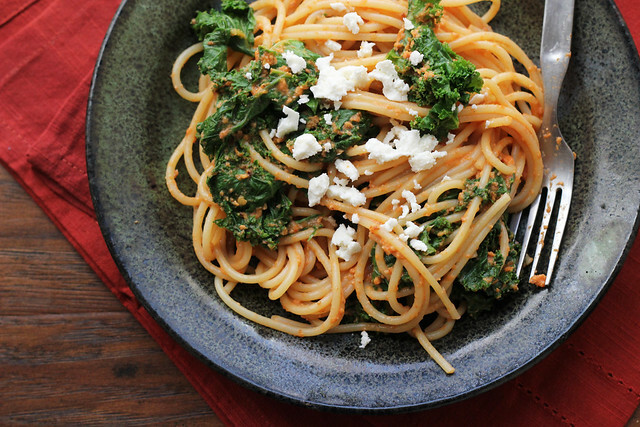 And this dish…roasted red pepper sauce over spaghetti looks and sounds delicious. I want some! And yuuuuummmm on the pasta, too..perfection. The new template looks very professional and great! Love the pasta…so full of flavours! I’m so comfy here. Think I can just hang around and stay awhile?? Love your new site! So pretty and functional, and the recipe index is so wonderful!!! We will have to re-do ours soon as well. 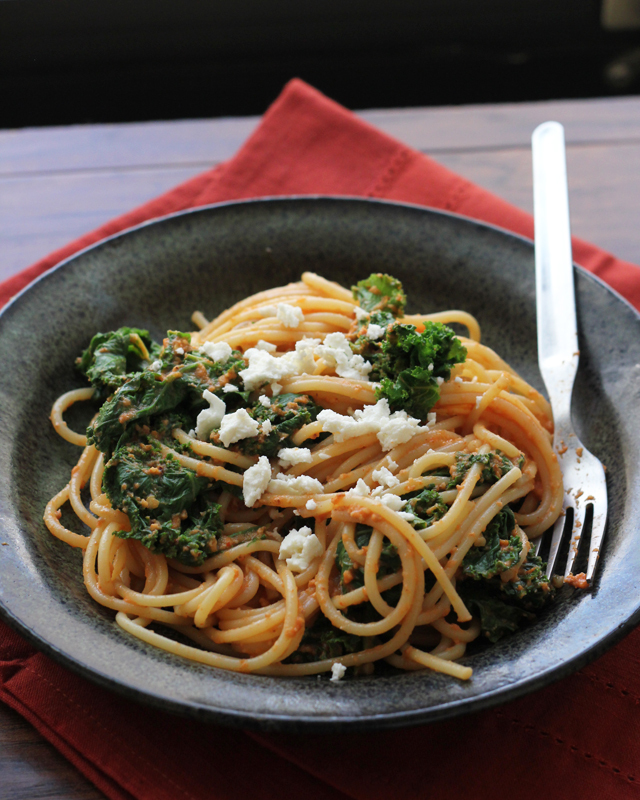 And the spaghetti looks so delicious, love the kale in there! Lovely site – I am sure it is a relief to have it completed. Very very nice, I like it a lot! YUM get in my mouth! Also, LOVE the new site, LOOKS FAB!! The site is BEAUTIFUL, Joanne. Congratulations and well done, my friend! The new look is fantastic Joanne. Someday I will move over to WordPress but as you mentioned the thought is daunting. Maybe after my daughters shower, my nieces wedding, paying my taxes, and my trip to Wenatchee..wink. In the meantime I know I would enjoy this pasta. LOVEEEEEEE the new site, lady!!!!!!! And obviously you, and the recipe! it looks lovely! Congrats! Enjoy! The new site looks wonderful, congratulations Joanne! I LOVE the redesign, Joann!! It’s so clean and beautiful, and I love the color scheme. So great!! We are pasta twins today. I love this one, Joanne. The whole flavor combination is right up my alley. And I ADORE the new design…for all the reasons your mentioned. It’s clean, classy and the colors are gorgeous! I was like a kid on Christmas Eve waiting to see the new site. And I just love it! 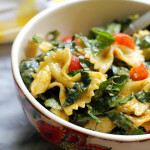 This recipe looks like an amazing way to use up the kale from this week’s CSA box! I was totally waiting to see this new site all weekend and it looks absolutely gorgeous! cute, fun and whimsical! Girl, I love it! The new design, layout, etc… Gorgeous! 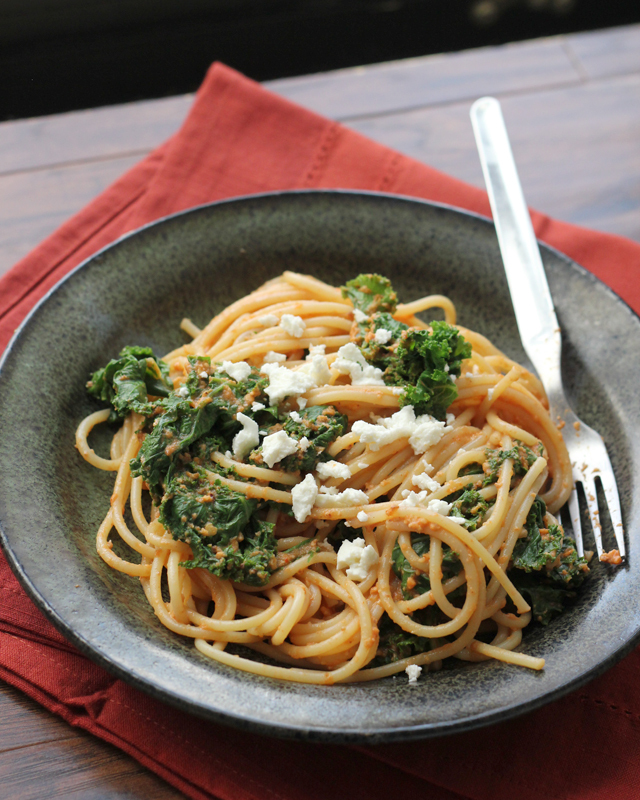 Love this recipe too… I will never tire of kale in anything. ahhhh, who doesn’t love a makeover?!? looks beautiful! I LOVE IT! It looks amazing, as does this pasta dish! LOVE the makeover – the blog looks great! The new look is great Joanne, no wonder I was unable to log on to your site yesterday! It does look nice and clean like you said. The pasta dish sounds great too! Yay, I love it! Welcome back! So how did the boy do with this pasta? Is he fully digging kale now? Good looking site and pasta too. Ziplist sounds very interesting, and I will check it out. Oh WOW! Joanne, your new site looks A-Mazing! I can imagine it was stressful and nerve-wracking and crazy for a while, but the results are oh-so worth it. I can’t wait to explore (starting with this awesome pasta with kale recipe 🙂 ). Congrats on a gorgeous site! I switched (or had the girl at Wooden Spoons Kitchen switch me)…it was a totally seamless painless process. DEF email me! The site looks great!! Switching can be stressful but it’s so worth it when it’s over. Congratulations! I love the new site design, it is clean and simple looking. Also, I am glad I have some leftover pasta for dinner tonight because your pics are making me hungry! LOVE! Your new site looks amazing. Congratulations! I love, love, love the new design! I feel the same way about my blog — so tired of the clutter. The clean look is gorgeous and inviting. And I seriously need a self-updating recipe index. Such a great idea! Oh yeah… that pasta looks awesome! I love the combination of this. I’m always looking for new ways to make kale. This is perfect! LOVE, LOVE, LOVE it! So perfect. wow, i absolutely love it! 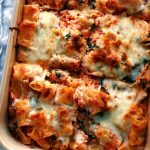 i need to do this with mine- will have to be in touch 😉 fabulous pasta, too, i hope you had a few bowl-fuls of this while you were going through all this! Congrats on the new design – I absolutely love it! Clean and simple, but so functional and pretty too! 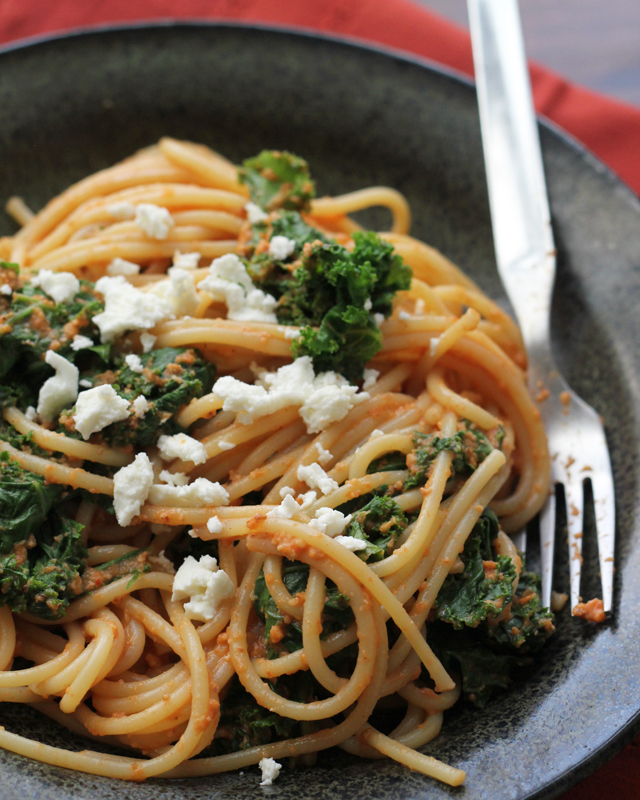 I also love this pasta – anything with feta in it is a win! Ah, I love the new look! I’m a sucker for a good clean site with nice fonts :). Love the new look, Jo! Great healthful recipe, too. Perfect for Summer dining when you don’t want to be dragged down by a heavy meal. I am in LOVE with your new design!! I also love this idea for kale. I’m always looking for new kale recipes…we’ve been getting so much in our CSA! Oh, I love the new site! Fantastic!! The new layout and design looks fantastic, esp the pastel hues color tones 🙂 love it! 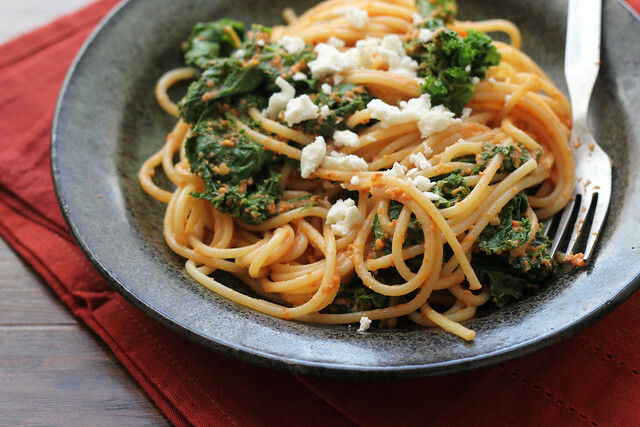 Loving your roasted red pepper pasta with kale too! Yum. This pasta dish looks so delicious and healthy! Looks great! The new site looks great, Joanne! Love how simple and clean it is. Congrats on getting it up and running 🙂 And this pasta looks wonderful! LOVE the new site, Joanne! It’s clean and gorgeous. Well done! Love the new layout! It’s beautiful! This pasta looks delicious too! I wish I could reach into the screen right now and eat your pasta. And the new site looks completely fabulous! Love the new look; and this recipe! Congrats on the new design launch! Beautiful recipe to go with it! I could not visit your website for the past few days, now i know why… beautiful webpage . Congratulations on the new look! It’s great and I know what you mean by clean….so nice. I will have to try the Ziplist. Right now I just save what I like on Pinterest but I like the idea of the grocery list it gives you. The pasta? So tasty looking like all your recipes! absolutely love the new look 🙂 so many cool features and i particularly enjoyed the seasonal recipes. Wow that is exciting. 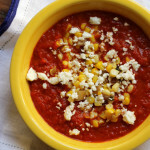 I had to peek around your new home before even reading this post because I was so curious – the recipe index looks great – have you deleted any recipes or are you keeping them all? Your blog has gone such a long way since you started and it looks great. Love the dish too but honestly I feel like I was tasting it just looking around the room admiringly. Not every day you have major renovations – but it seems very you! I am keeping them all! I haven’t included the meat recipes in the visual recipe index but they are still around. Thanks chica! Your new site looks utterly gorgeous! And your pasta is just as awesome what a delicious recipe! The new site! The pasta! I LOVE ALL THE THINGS! But seriously, beautiful new design, Joanne (and I’m totally drooling over it already with that pasta ;)). Love the new site! And this pasta… both awesome! It’s beautiful. I can only imagine how satisfying this whole thing must be! It’s so much work to transfer content over. It was a nightmare when we did it. It looks flawless!!! It IS very scary moving! I’m glad it all went well – it’s gorgeous! I can’t stop looking at it. Just like this pasta! Love the combo! Not exaggerating one bit when I say that I love, love, LOVE the new design. Seriously, it’s what I wish my blog looked like… And the fact that it’s so functional and user-friendly is the icing on the blog cake. Someday, when the pain of the move has faded a bit, I’d love to pick your brain about the logistics… I’m still dreading making such a big leap of faith and changing things around, too. Clean and beautiful it is, Joanne! Congratulations! The red pepper pasta has my mouth watering! Joanne, I LOVE the new layout of the blog!!! It looks awesome!!! Love the new look! For some reason your updates aren’t showing up in my reader, but I think I fixed it. I thought it was weird you hadn’t posted in a while, so I’m glad I decided to visit. 🙂 We made this pasta and it was a big hit with us too.